Getting a website is a notoriously difficult, expensive and time consuming thing, but it doesn’t have to be! If you want to get booked ever? Yes! By having a website you give yourself an advantage. It can make you look like whatever you want! Do you want it to look professional to get high end gigs? You can do that! Want it to look playful so you can book kids parties? Go ahead! Want it to be packed full of some of the magic photos and videos that you have in your collection? Let’s do it! Your website allows you to choose the light in which your potential customers view you in. It is not a place for you to show off. That’s what social media is for. Your website has ONE purpose: get people to book you for their events! Contact details, photo of you, information about what you do, name of at least 1 past client (could have been volunteer). I bet you have everything in the “NEED” category. Get the checklist when you subscribe to our newsletter! Thanks! Go check your email to download the checklist! 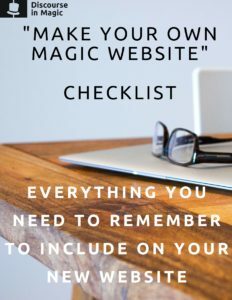 It's honestly packed full of tips for making your website! If you have a domain already and you aren’t happy with your website you can jump to the next section. The truth is nobody is coming to your website if it has something in the domain name that shows you didn’t pay the minimum amount to own a website. Even if they did, you don’t want them to! It’s embarrassing to ask people for money when they can see that you don’t care enough to invest in yourself. It might cost you anything from $50 to $1000 per year, depending on the method you use to have a website. It’s basically the cost of one to a few gigs a year no matter how you slice it but it makes you so much more important and relevant. Google and other search engines picks up peoples real domains WAAAY better than a domain you don’t own. Most importantly without your own URL your credibility in the eyes of potential clients goes down dramatically, and they’re right to think so. If you’re reading this article, it’s time to change it and get a real website. Good news is, I can help! It costs a little bit of money to own a website but the method I’m going to give you is going to be extraordinarily cheap, you can do exactly what you want, and it’s super easy. How do I get a website with my own domain? First let’s talk about domains: here are some options for domain name. I recommend your name + .com ex: jonahbabins.com, but if either your name is way too common, or hard to spell get creative, but keep it easy. Please no jonahbabinsmagic17, or something like that. It makes it clear someone got what you wanted first. Leave all random numbers out of your domain name. It’s not like your childhood email address. You first need to find out where you’re going to host your website. Jonah, What does hosting mean? Let me explain: your website: text, photos, videos, colours, fonts, etc.. takes up space on the internet. Somebody somewhere in the world has a building full of computers continuously accessible to the internet which hold peoples data. Hosting is you paying one of the people to rent out space on one of their computers for your site. It’s like your parking space on the internet. When looking for hosting services you have to make sure that you buy hosting from the right company, because they can often have tricky offers. For example you might find out that it’s really really slow or you might pay for a spot and find out that you didn’t read the dotted lines and after a few months the monthly rate changes drastically. Or worst of all, you could find out, that there was a maximum storage and all of your data filled it up already, or is making it unusably slow. My recommendation is to either know what you’re talking about or talk to somebody, or seek advice from somebody who does to make sure you’re getting a trustworthy company. You’ve probably heard of some hosting companies already like Hostgator, GoDaddy, BlueHost, or maybe some others. I’m going to tell you about the one that I use, which is probably the most trusted hosting service around, and why I love it. Unlimited bandwidth – Some companies say they’re offering unlimited bandwidth but not after you read the dotted lines, Dreamhost actually does! Voted best web hosting service 3 years in a row. To reward you for being a fan of Discourse in Magic I have a coupon code for you below! The regular price for what we’re looking for which is called “shared hosting” from Dreamhost costs $97/year. For under $100 dollars a year to never worry about hosting problems, and have it always working is perfect. Personally I know that I make that back in under 1 event which my website will help me book. To me if you are looking to get any more magic gigs then you have right now it seems like your best first step is a website (or a good one if it’s your second step). And you get you domain for free. Click link, or the image below to get the Discourse in Magic exclusive deal! If you choose to go with another hosting service here are some of the other top competitors. Feel free to google any of them + “reviews” to get a feel for what other people think about them overall. HostGator, GoDaddy, 1&1, InMotion, Bluehost , Hostwinds, Arvixe, Liquid. Note: many of these companies have cheaper services. Please make sure you read carefully how many years you get of the price offered, and exactly what is included. So you’ve rented out space on the internet. Now you have to put a website there! There are tons of ways to do it, but here are the top 3 options right now to suit the ability to change photos, text and videos, mobile friendly and fast (enough) – all without coding. There’s a reason why people pay thousands of dollars for a professionally designed website. Professionals who design websites for functionality, beauty, speed and cleanliness with everything optimized is priceless. As a matter of fact my new website was the first time I did not go with a good trusted friend as a designer, because I knew I wanted to change it often. If you have the money to shell out and you are far enough forward in your career, it would be worth getting a designer. Better you spend that money on a top notch photo shoot or a videographer for your next event to act as great booking material. While I haven’t used Squarespace myself it’s highly recommended from friends and peers. The only issue is that it has a slightly higher cost per month than some other approaches, but it includes both the hosting from above and some very easy methods for drag and drop to design your website. The others I’ve tried and didn’t love. Plus the wordpress theme I use below, has proven to be better than wix/weebly editing for my purposes. Also I personally try to stay away from someone who I need to pay monthly to keep the design of my website. This is the option that I use. And I will give you the pros and cons. Pros: 25% of the websites that exist on the internet use WordPress (nothing else even comes close to that number). It’s the standard for having a website on the internet, has been for decades and it’s completely free. If you’re going to have a blog (which I and Lou Serrano Recommend highly for your website in the future if not now). WordPress is intuitive and very easy to use and since it’s free millions of people create and share plugins and add-ons free and paid. Anything you can wish for someone has figured out how to do on WordPress already. The reason why I recommend this most is because I think its easy, fun and necessary to test and try new things on your website until you find something that works. It’s likely even if a designer designs it. He’ll make make it a WordPress theme to make it editable. You can actually get free themes, there are a ton of them on the internet. But I wouldn’t recommend it. As they say, you get what you pay for. If you purchased Dreamhost from above, or most other hosting platforms there’s a 1 click WordPress installation which takes a about 5 min to set up. Super super easy and if you got hosting here you already have it. Most importantly the theme that I use, that I will share with you below is on the relatively cheap side for themes. But also allows you to edit it endlessly and to edit the pages ridiculously easily. Picking from dozens of pre-made layouts and options. If you went with either Squarespace or hiring a nerd then you can stop reading here you’re dead to me!! KIDDING any magician with a website is a friend of mine!! But for the rest of you going with WordPress: there are thousands of WordPress themes on the web ranging from free to thousands of dollars. In the last decade there’s been a movement to make themes that are very editable, for people who don’t know how to code. They’re called “drag and drop themes or drag and drop builders”. Since you’re going to be making your website entirely yourself, I would look for a drag and drop theme. It means that you can move things around, change sizes positioning and items easily. Luckily for you I went on a LONG journey myself to find the best one. It’s called Themify. Take a look through their themes here. Click their name or the link below it. Take specific look at the themes called: Paralax, Peak, Ultra, Float and Fullpane. They don’t have examples for magicians, but their restaurants and musician examples are pretty relatable to a magic website! I recommend buying a single theme (getting a second one free) instead of joining the themify club. A one time payment is all you need, and it costs $49. It’s honestly fun to build my own website with this thing. Between the hosting and the theme for under $150 you can have it all set up! How cools is that! So, once you get a Themify theme, building it is pretty easy and intuitive. First decide what pages you want, and then create them. Decide what you want to be on the menus in the header and footer, create it, and edit it the way that you please. Now you can design the pages all yourself! I don’t advise inventing your own designing. Here is how I would recommend designing your website. Look at a few other magicians websites. Without copying them, look at what each page looks like. Where the photos are, what pages they have, how it’s all aligned, and what sort of things they are saying. Since you aren’t them, you’re going to want to change things like colours fonts, photos, and whatever you want. The most important thing is that you don’t try to invent a new way. Pick something that works and make it your own. Looking at the templates that they have on Themify you should be able to design something that looks like a designer did it (since a designer actually did one of the websites that you’re mimicking). Lots of photo and video. People need proof that you do what you do. It’s worth spending money on a photo shoot, or bringing a videographer into a good event. Make it very easy for them to contact you by email, cell number, contact form or anything like that. Just make it very visible on the site. If you’re starting out, all you need is a one page website with what you do some photos, videos, customers and how to book you. Branding is the most important part. Before you start creating make sure you know who you are trying to serve, decide what colours you think it’s representative of, what type of feelings you want to bring forward in people. It’s critical that you have a good idea of your fonts, colouring style, and branding for exactly who you are trying to speak to. This would be the number one place I would seek guidance if you are looking to have a beautiful online presence. Experiment! With new photos and new videos and news testimonials you’re going to be able to want to update it to look like your best self always. Make sure there’s room to do that! There you have it the complete guide for how to do your website by yourself. Now it’s time to got out there and do it. Day 3: Look through Themify Themes to find the one that suits what you imagine the closest. Since you’ll probably have a website style in mind already, choose one that looks the way that you like. They have a ton to choose from, and you can change every last detail if you want. Create the pages you want, make the header with the menu and the footer with the menu to have all of the pages you want. You are just pressing create page. Day 4: Finish your on paper designs and start implementing it on the web with the drag and drop builder. First step is finding an outline that they have, then changing the photos, text and details to fix what you imagined. Day 7: Pick a nice font and implement it everywhere on the customize page. Now you have a website. Once again, a big thank you if you choose any of them, since we get a small commission each time you do (to no extra cost to you)!